Inter Milan went top of Serie A after holding on for a 3-2 win against Sampdoria at the San Siro. 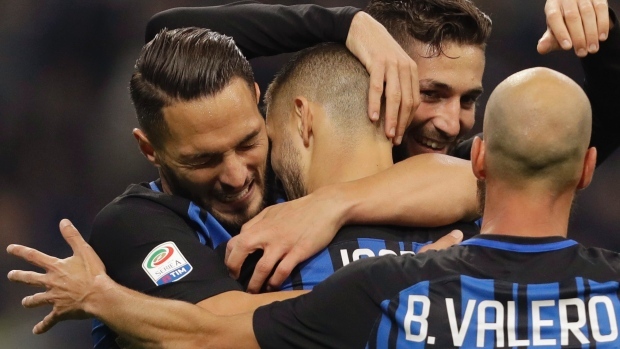 Goals from Milan Skriniar and Mauro Icardi gave Inter a 2-0 half-time lead and the latter made it 3-0 early in the second half before Sampdoria hit back through Dawid Kownacki and Fabio Quagliarella to ensure a nervous finish. Luciano Spalletti's side climbed one point above Napoli and extended their unbeaten start this season to 10 matches. Spalletti has played down Inter's title chances but victory was their eighth of the campaign, while Sampdoria, who had won five of their previous eight, slipped to only their second league defeat. Ivan Perisic, Danilo D'Ambrosio and Antonio Candreva had all gone close before Slovakian defender Skriniar turned home Matias Vecino's knock down following a corner in the 18th minute. Perisic's brilliant 35-yard shot hit a post soon after, but Inter struck a second when Icardi fired a low angled shot into the bottom corner from inside the penalty area. Inter hit a post again shortly before the break through Icardi's header, but the Argentinian tucked home his second of the night and 11th of the season in the 54th minute from close range after being picked out by Perisic. Perisic hit the woodwork for a second time when his angled shot came back off the crossbar before Sampdoria pulled one back through substitute Kownacki's close-range finish in the 63rd minute. Quagliarella headed home Dennis Praet's cross from close range with five minutes left, but Inter held on.